At the end of September 2013, according to the latest registry reports, there were more than 150 million domain names registered in generic Top Level Domains (gTLDs). 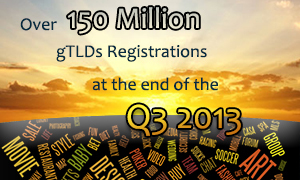 Across all eighteen gTLDs, the total number of registered names was 150,173,219 as of September 30, 2013. As expected, .COM tops the list with over 113 million domain names followed by .NET, a distant second, with 15.5 million registrations. Five gTLDs reported shrinking numbers when compared to August: .INFO, .PRO, .ASIA, .TEL and .MUSEUM. The fastest growing domain was .BIZ with its 2.65 its 2.65 million domains up over 7%, according to the August 2013 data.